From gift wrapping to Christmas trees, department store Santa’s and beyond, what started as a religious holiday has taken on commercial significance. 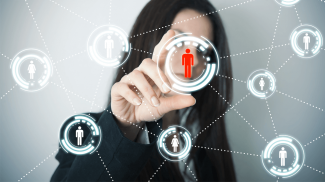 Entrepreneurs, marketers and businesses large and small have certainly all played a role. But how did Christmas become so commercialized? Read on for a detailed overview. It was F.W. Woolworth who first brought glass ornaments from the German cottage industry to the mass market in the US. In 1880, $25 worth of hand blown glass ornaments were purchased for his variety store in Lancaster, PA – all of which sold within two days. Fast forward to ten years later and more than 200,000 glass ornaments made from more than 6,000 recorded designs, each by individual families, were being imported into the US. The rest is, as they say — history. The first documented Christmas tree in the US was recorded in 1747. This was in Bethlehem, PA at the Moravian Church settlement there and it was reportedly a wooden triangle covered in some evergreen branches. In the early part of the 20th century, Santa Claus (otherwise known as “Sinterklaas” in Dutch) was rather spooky looking and certainly not the jovial fella’ we’ve all come to know and love in modern times. Nothing really – other than the influence of Coca Cola and some well executed holiday marketing. 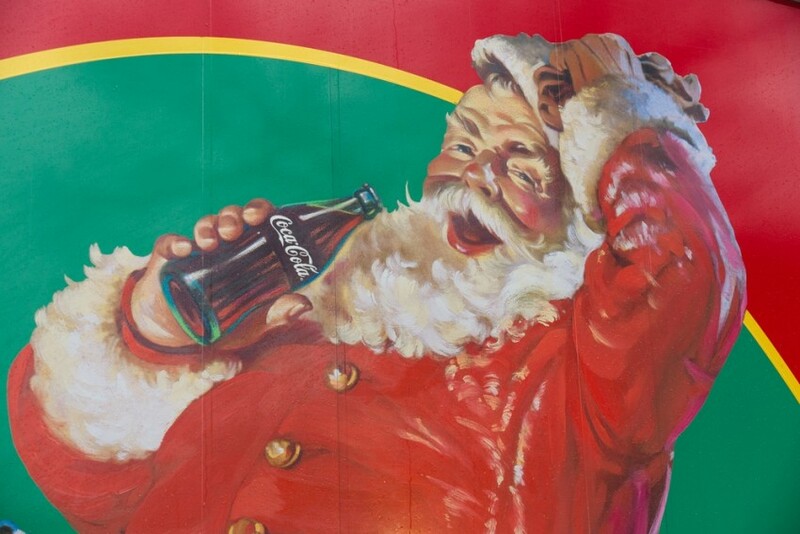 Coca Cola ads featuring Santa Claus first began in 1920 in the Saturday Evening Post. By 1931, Santa was making appearances in Coca Cola ads in popular magazines, but a more wholesome Santa was desired. It was then that Coca Cola commissioned an illustrator by the name of Haddon Sundblom. That year, in 1931, a more jolly Santa Claus appeared in National Geographic, Ladies Home Journal, and the New Yorker among others. Sundblom’s work and his version of Santa Claus (pictured above) in those years is now some of the most desired depictions of holiday advertising (and Santa Claus himself) for Christmas collectors and advertising collectors alike. The original artworks are housed in the Coca Cola archives and they have since been exhibited all over the world. Ah, our “deer” Rudolph. This little guy wasn’t born under a hemlock tree in the forest. Oh no. Our dear Rudolph (who was almost named Reginald) was born — at Montgomery Wards. Yes, that’s right. He’s another example of genius marketing, timed just right. 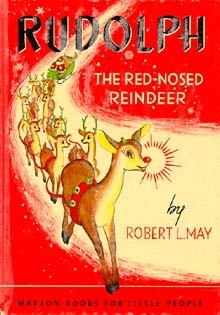 Rudolph was born from a massive marketing campaign in 1939 in a book written by a company advertising copywriter by the name of Robert L. May. The purpose? To drum up newspaper coverage. The book Rudolph the Red Nosed Reindeer was authored by May and was then given away for free. 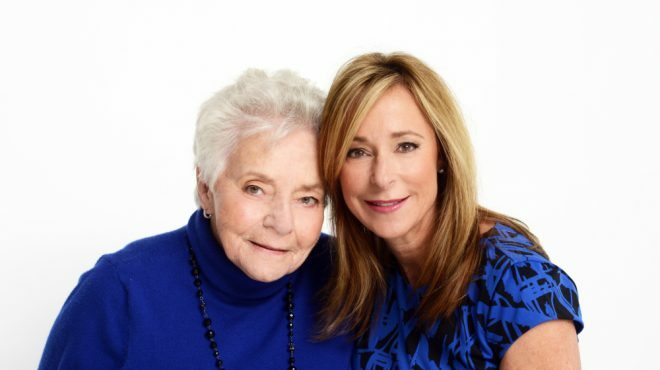 (More than 2 million copies were distributed during a time when 50,000 was considered huge). As you can see, those suggested terms never caught on. However, in the mid-80’s, retailers began to divulge that the term was actually in reference to the day after Thanksgiving being the first day profits would move out of the red – and into the black. Ka-ching! When it comes to Cyber Monday, this too was birthed from marketing by a division of the National Retail Federation, Shop.org, in 2005. “In 2010, the Small Business Saturday promotion was created and sponsored by American Express, who registered the URL SmallBusinessSaturday.com and registered the trademark for the term Small Business Saturday,” according to SmallBusiness.com. When it comes to holiday treats like candy canes and the Yule Log, both have a long history dating back centuries. Shopping Mall Santas started in 1841 at a Philadelphia store that had a life-size model of a Santa Claus that drew children to it. 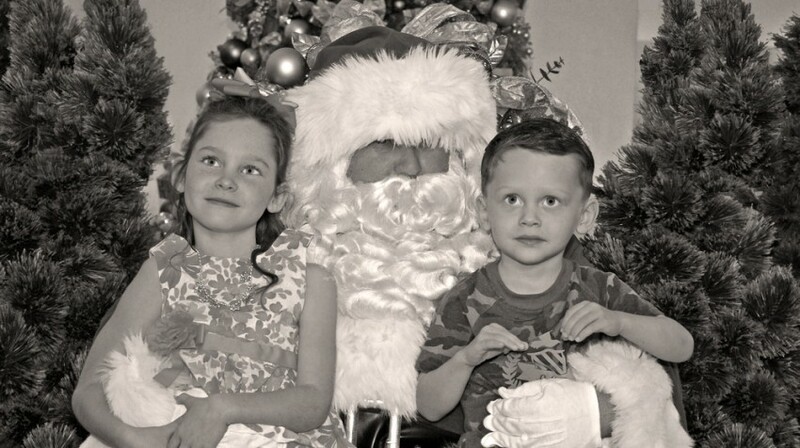 This spawned a trend in which store owners offered opportunities to see a real “live” Santa. Scroll down in this story for more and check some other references to see if we can find the name of that store in Philadelphia. R.H. Macy of Macy’s in New York City was one of the first department store owners to construct special holiday presentations. And in 1862, he was the first to feature an in-store Santa for children to visit. By the 1890s, the Salvation Army had begun the practice of sending “Santas” into the streets of New York City to solicit donations to pay for holiday meals for the needy. One of the best examples of commercialism and now a multi-million dollar industry, the Christmas card dates back to 1843. The first commercial Christmas card was put out by Sir Henry Cole. “Gift-giving has its roots in pagan rituals held during the winter,” the Christian Science Monitor reported. Also the twelve gifts associated with Hanukkah have contributed to the gift giving bend of the season. Started in 1966, WPIX-TV (Channel 11) in New York City filmed the fireplace of then-Mayor John Lindsey at Gracie Mansion, the official mayor’s residence. The fireplace was aired with easy listening music in the background. The station cancelled advertising and a roller derby show to air the fireplace, which has become an iconic image of the holidays. Alternatively panned as creepy and adored as a fun holiday ritual, the trademarked Elf on the Shelf dates back to 2005, when author Carol Aebersold self-published a tale of a little elf sent by Santa to report on children’s behavior leading up to Christmas. A toy elf sold with Aebersold’s book plays that role in thousands of homes around the country. Wrapping paper in some cultures, most notably Japan and Korea, goes back many centuries. But here in the West, wrapping presents in pretty paper dates back at least to the Victorian era. Today it is a $2.6 billion industry. Santa, Sundblom Santa Images via Shutterstock, “Rudolph, The Red-Nosed Reindeer Marion Books” licensed under Fair use via Wikipedia. I think that Christmas is a little bit hyped as much as Halloween and other holidays. It is like an excuse to buy products that we don’t need and we are even trained to impose it on other people as ‘gifts’. I don’t agree with you. Xmas should be more commercial. It is good for small businesses. Nice post on Xmas and how it has developed during times. I recommend you to read Dr. Leonard Peikoff’s article, Why Christmas Should be More Commercial. I wish you a Merry Yuletide and Prosperous New Year! I am so sorry you feel this way. Christmas was never about gifts and commercial. Christ mas as you can see, it’s all about the birth of Christ. Without Christ, there would not be Christmas. Maybe someone would have started a holiday where there’s gift giving, but it should be named something else. It SHOULD NOT BE A NAME WITH CHRIST IN IT. Christ mas is a day to celebrate the birth of Jesus. Exactly!! Every religious holiday has been turned into a celebration of gluttony, greed and avarice!